Ideal for your home or office workstation, this Protect It!® 8-outlet surge protector features a surge protection rating of 1200 joules to defend your sensitive electronic components against strong power surges and spikes. Because residential power outlets have three wires-hot line (H), neutral (N) and ground (G)-the TLP88TUSBB protects all three, covering the two protection modes: full normal mode (H-N) and common mode (N-G/H-G). Plug your PC, printer, wireless router, game console, television, sound system or other home/office electronics into eight NEMA 5-15R outlets to protect them against dangerous surges, spikes and line noise. Three outlets are widely spaced to accommodate bulky power transformers without blocking adjacent outlets. Built-in safety covers prevent dust and debris from falling into unused outlets. Built-in RJ11 jacks allow connection of telephone, fax and modem equipment. The TLP88TUSBB prevents dangerous "back door" power surges from damaging your data line components. 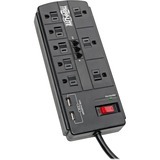 This surge protector with 2 USB ports is ideal for keeping your devices at full capacity. Two USB-A ports are available for charging your smartphone, tablet and other USB mobile devices, which are also protected from the damaging effects of surges, spikes and line interference. Various electromagnetic and radio sources found in virtually every home and business can cause disruptive interference on the AC line. Known as EMI (electromagnetic interference) and RFI (radio frequency interference), this line noise is a common cause of performance problems. This surge protector filters out disruptive line noise that can disturb your electronics and inflict hardware damage or data loss. This EMI/RFI filtering also helps your connected components perform better and last longer. The lighted on/off switch provides one-touch control over connected equipment. A green LED confirms your connected equipment is protected. This surge protector with 8-foot cord and space-saving right-angle NEMA 5-15P plug helps you connect to a wall outlet located behind furniture placed flush against the wall. Keyhole slots incorporated into the bottom panel provide convenient wall or desk mounting options for the black plastic housing.